The Miles M.7 Nighthawk was a 1930s British training and communications monoplane designed by Miles Aircraft Limited. The M.7 Nighthawk was developed from the Miles Falcon Six intended as a training and communications aircraft. 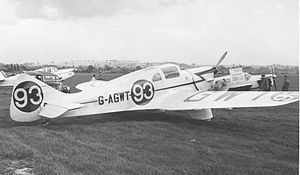 The prototype, registered G-ADXA, was first flown in 1935, it was a low-wing monoplane powered by a 200 hp (149 kW) de Havilland Gipsy Six piston engine. The prototype crashed during spinning trials at Woodley Aerodrome in January 1937. Four production aircraft followed. The design was modified to meet an Air Ministry specification and produced as the M.16 Mentor. In 1944 a Nighthawk fuselage was fitted with the wings from a Mohawk and fitted with a 205 hp (153 kW) de Havilland Gipsy Six Series II engine with a variable pitch airscrew. It was designated the M.7A Nighthawk. The last Monarch to remain airworthy was G-AGWT in the early 1960s. This aircraft was raced in many postwar UK air competitions. Two aircraft were delivered to the Romanian Air Force in 1936 and one was delivered to the Royal Air Force with serial number L6846. M.7 Production version with a 200 hp (149 kW) de Havilland Gipsy Six piston engine, five built. M.7A Hybrid version with Nighthawk fuselage and wings from a Mohawk and powered by a 205 hp (153 kW) de Havilland Gipsy Six Series II engine, one built. Miles Nighthawk Pictures and Miles Nighthawk for Sale.